TOTAL TIME: Prep: 15 min. Grill: 35 min. Carefully open foil. 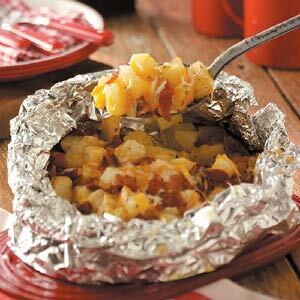 Sprinkle the bacon cheeses over potato mixture. Grill 3-5 minutes longer or until cheese is melted. Open foil carefully to allow steam to escape. Yield: 4-6 servings.